We offer a wide variety of Turbine Pumps engineered using high grade material and precision technology. We have in store oil vertical pumps and water vertical pumps in this range which are in conformance with the international standards. Mainly used in the petroleum industry, these pumps are long lasting and highly durable. They have gained popularity among clients across the world. 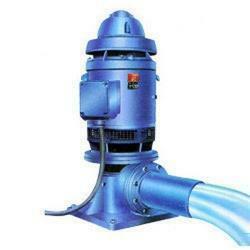 We offer these turbine pumps at competitive prices. Customers can purchase from us highly versatile Water Vertical Turbine Pumps which operate at low speeds thereby saving power consumption. These pumps are used in high-head applications i.e. where the liquid are to be pumped out from underground water tables of all kinds. Water can be pumped upwards from open water bodies such as oceans, lakes, rivers and ponds. They are used along with boosters, pipelines, and low NPSH systems. These pumps do not require priming and are highly efficient. Hydraulic conditions can be easily changed. These pumps make use of minimum floor space codes. Manufactured from the corrosive resistant material, the components used in the pumps last longer.